What is the waiting period for a firearm purchase? The waiting period for the purchase of a firearm is ten (10) 24-hour periods from the date and time the DROS is accepted by DOJ, and a unique DROS number is issued. Who is exempt from the waiting period? California law enforcement officers who have a letter signed by the head of the agency stating they are full time paid peace officers authorized to carry a firearm in the performance of their duties and authorizing the purchase. The dealer must retain the original letter and attach it to the DROS record. Persons who have special weapons permits issued by DOJ. The dealer must retain a copy of the permit and attach it to the DROS record. Persons who have a Curio & Relic Collector's license issued by the Bureau of Alcohol, Tobacco, Firearms and Explosives (BATFE) and who have a valid Certificate of Eligibility (COE) only when purchasing curio and relic firearms. The dealer must retain a copy of the Federal Firearms License, Collector's license and the COE. Dealers transferring firearms (hand gun and/or long gun) to their personal inventory are required to complete the DROS process. The BATFE's acquisition/disposition log requirements still apply. What are the firearm warning label and firearm safety device requirements? Each firearm sold by a firearms dealer must be accompanied by a child safety warning label. The DOJ has certified independent laboratories to test safety devices for compliance with the adopted standards. Any manufacturer of firearm safety devices who wants to have a particular device certified for sale in California must submit the device to a DOJ-certified testing laboratory. The DOJ-certified laboratory will test the device and forward the test results to DOJ. Subject to DOJ application and fee requirements, qualifying devices may be approved by DOJ for inclusion on the Roster of Firearm Safety Devices. For more information, please see the frequently asked questions for Firearm Safety Devices on the DOJ site. What documentation is acceptable proof of residency for handgun purchasers? "Utility bill" means a statement of charges for providing service to the individual's residence by either a physical connection (i.e., hard wired Internet, telephone connection or cable connection, or a water or gas pipeline connection) or a telemetric connection (i.e., satellite television or radio broadcast service) to a non-mobile, fixed antenna reception device. The individual's residential address as it appears on his or her California Driver License or California Identification Card, or change of address attachment thereto. The individual's address as it appears on his or her California Driver License, California Identification Card, or change of address attachment thereto. Electricity, gas, cable bill with purchaser's name on it from within the last 3 months. Signed, dated and notarized rental agreement/contract. Hunting or fishing license (these documents are not issued by the government). 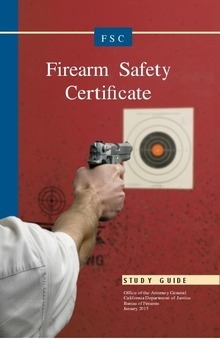 What is the Firearm Safety Certificate (FSC) requirement? Prior to purchasing or acquiring a firearm, unless exempted, you must have a valid Firearm Safety Certificate (FSC). You must present your FSC to the firearms dealer at the time you begin a transaction to purchase or acquire a firearm and at delivery. The dealer must maintain the documentation with the DROS paperwork for the FSC or the exemption. For more information, please see the frequently asked questions for the FSC program on the DOJ site. What are the handgun safety testing requirements? No handgun may be sold, manufactured, etc., in California unless it has been safety tested by a DOJ-certified laboratory, found to have passed safety/reliability standards, and approved for sale by DOJ. 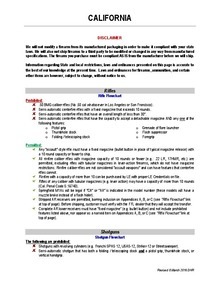 Firearm manufacturers and importers, who wish to certify a handgun model for sale or manufacture within California must submit three copies of the handgun model directly to a DOJ-certified laboratory for testing. Upon approval of the test report and payment of listing fees, the handgun is listed on the DOJ Roster of Handguns Certified for Sale. The roster lists qualifying handguns according to: make/model/caliber/barrel length. A change in any one of the roster categories is considered a new model and requires a new certification. Only handgun models listed on the roster may be manufactured, imported for sale, or sold in California. Private party and law enforcement transactions are exempt. A listing of certified handgun models is currently available on this website at http://certguns.doj.ca.gov/. Are there a maximum number of handguns that a person may purchase? Yes. A person is generally limited to making no more than one application to purchase a handgun within any 30-day period. Handgun transactions related to law enforcement, private party transfers, returns to owners, and other specified circumstances are exempt from the one-handgun-per-30-day restriction. 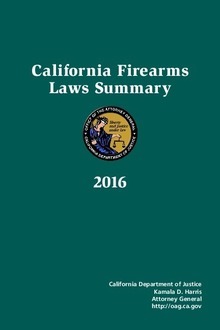 Download "CA Firearms Laws Summary.pdf"